Rebecca Sibley recounts her fantasy weekend break in the gorgeous French medieval city of Carcassonne. 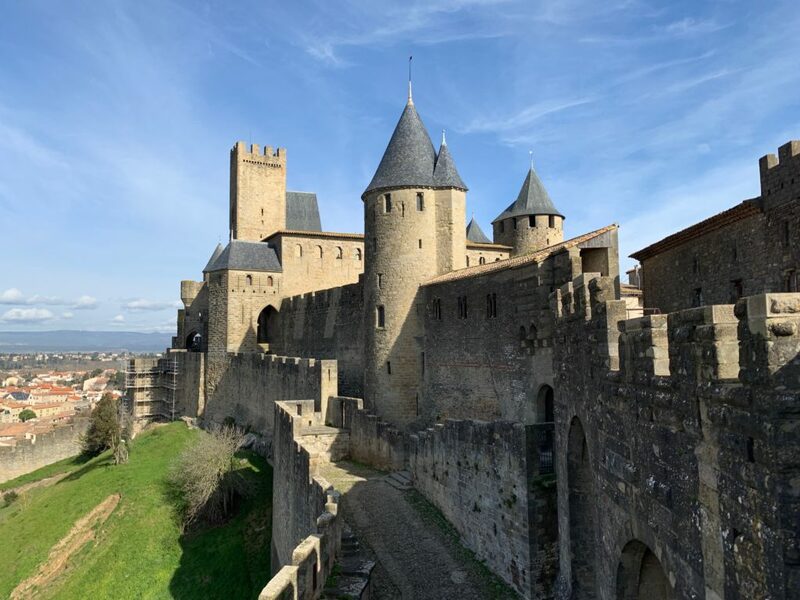 Share the post "Carcassonne is a frugal romantic getaway"
As a student, there’s nothing more romantic than a weekend break that doesn’t dig you too far into your overdraft. A weekend in Paris, always considered the “City of Love”, doesn’t exactly come cheap, so my boyfriend and I looked further afield to find our perfect last-minute, low-budget city break. 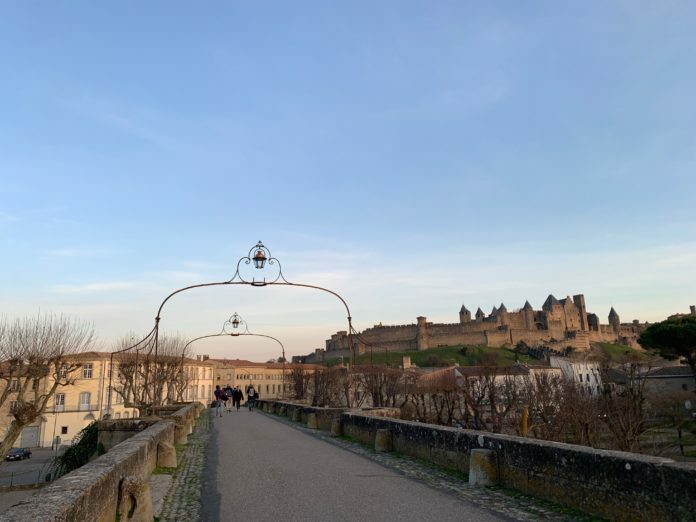 We decided upon Carcassonne, a city in the south of France where, for low cost Ryanair return flights, you can enjoy a weekend that is trés sophistique, as well as being fairly cheap. After a two-hour flight from Dublin, we arrived at the tiny regional airport in Carcassonne. It was a relief to step off the plane into warm late-afternoon sunshine after the dreary wetness of February in Ireland. Even though all the information at the airport was in French, there seemed to be no way into the town except via a shuttle bus, so we jumped aboard the only transport option. On the bus, we caught our first glimpse of the medieval city on the hill above the town. Even larger than it had appeared in photos, the towers and fortifications loomed magnificently over us, dwarfing the town below. The fortified citadel, which is now a UNESCO world heritage site, dates back to the days of the Celts and Romans and was supposedly the inspiration for Walt Disney’s Sleeping Beauty. It certainly seemed like something from a fairytale as we saw it in the distance, silhouetted against the pastel-coloured sunset. Our accommodation was the Hotel Adonis which was situated at the base of the hill. For a reasonable price the room was simple but spacious and had a small kitchen. After checking in, we walked up the hill and spent the rest of the evening exploring the cobbled streets of the medieval city by the glow of the yellow streetlights. It’s hard to resist having at least one fancy meal in France, we decided have ours in a restaurant called Auberge Dame Carcas, which offered a range of three-course set menus for decent prices. The food was delicious and exactly what I was craving after eating nothing all day except a Tesco meal deal on the way to the airport. We woke up early the next day and spent the morning exploring the markets at Place Carnot in the town centre. After sampling lots of fromage, we filled our bags with paper-wrapped chunks of cheese, butter and salami, as well as French baguettes for our dinner. This required a little French for those market sellers who didn’t parlez any anglais, but we managed fine with my boyfriend’s secondary school French and trusty Google Translate. If you don’t have any French or it’s a little rusty, it’s worthwhile practising some key phrases because unlike in France’s bigger cities, not many people speak fluent English here. Plus, it’s respectful and wins you brownie points with the locals if you address them in their own language. After our shopping, we sat outside a café and dined on steaming pain au chocolat and cups of tea. We walked back up to the medieval city and paid a few euros for entry to the château, which also gave us access to the paths along the top of the city walls for amazing views of the town, the green fields beyond and snow-topped Pyrenees mountains in the distance. 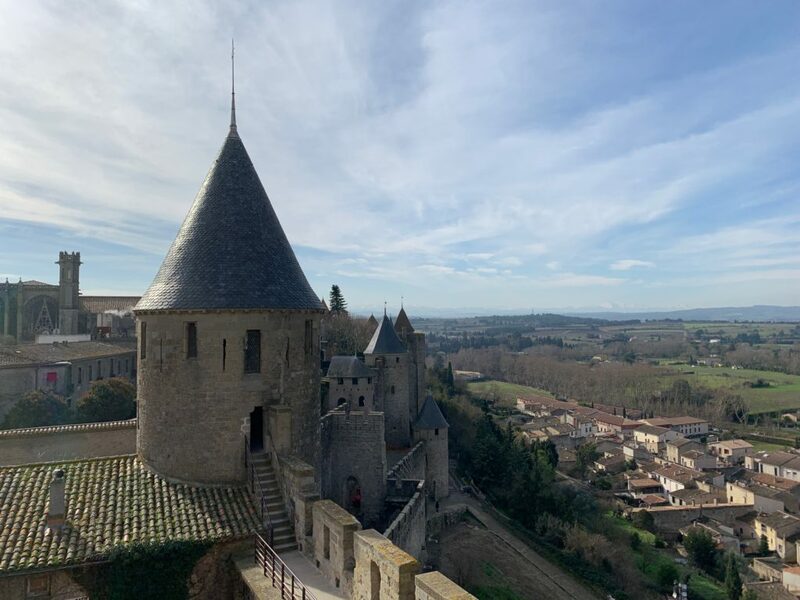 Whether you’re just there for the nice views, are a history buff with a love of fortifications, or just low-key enjoy pretending you’re in Game of Thrones (guilty), the château and city walls are a lot of fun to explore. We spent a good couple of hours walking around the fortifications and appreciating the bird’s eye view over the cobbled streets. In the off-season, the château doesn’t get particularly busy, so apart from one or two other tourists and a bunch of children running around brandishing wooden swords and shields, we had the place mostly to ourselves. We spent the rest of the day wandering into quaint shops, a beautiful cathedral, and the gruesome Museum of Inquisition, a creepy mannequin-filled exhibition about medieval torture which I am certain will give me nightmares for months. As the sun was setting, we positioned ourselves on Le Pont Vieux to take some pretty photos of the medieval city at its most Disney-like. For dinner, we prepared our purchases from the market and paired them with a bottle of local red wine that cost less than a pint in Dublin. It was a low-budget meal, but it felt trés chic nonetheless. On the morning of our departure, we had a leisurely breakfast of pastries and explored a little more around the town at the base of the hill before catching the shuttle back to the airport. When we disembarked from the plane in Dublin we were greeted by a gust of wind and rain to the face, as if the weather was reproaching us for thinking we could escape to the Mediterranean sunshine. After such a lovely weekend, however, I didn’t really mind. Next articleWhat do Russia, Thailand and two Nobel prize-winning economists have in common?